As published on LinkedIn Influencers on December 7th, 2017. It’s that time of the year again. The time of year when your to do list seems to triple in size, your evenings are filled with parties and gatherings, and you eat way too much delicious food and sneak that extra mug of eggnog. Yes, the holiday season is in full swing, which means once again I’m on the hunt for the perfect gift for the special people in my life. Not just the perfect gift for them, but the perfect gift from me. 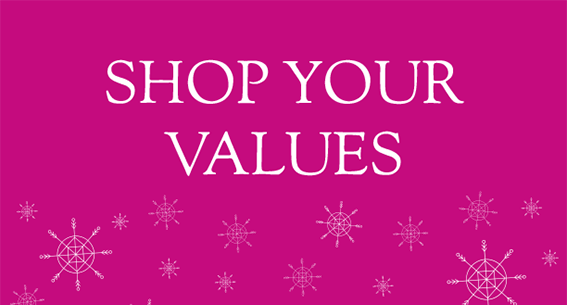 I’ve long since advocated for shopping your values and using your purchasing power as a tool for social change, and every year around the holidays I get to put this into practice even more than usual. I love giving gifts and presents to those I hold most dear, but I also love that these gifts can be more than just beautiful necklaces, scarves, cufflinks and handbags. I make a concerted effort to purchase handmade products made by incredible female artisans around the world, and these purchases in turn support their businesses and economic empowerment. I love that in giving these gifts, the recipients become a part of my passion for advancing women and girls. Every year Women Moving Millions releases a Shop Your Values guide in time for the holiday season, and earlier this week the 2017 version was unveiled. It’s filled with incredible organizations who are supporting women artisans around the globe and offering for sale a wide variety of products, and this guide will allow you to complete all of your holiday shopping from the comfort of your own home. No need to take your life in your hands by venturing into a mall this close to Christmas. Below is a sampling of the featured online shops, but there are dozens more listed in the guide. To view the full list, please click HERE. GEMS By The Foot – Made with genuine gemstones, Gems by the Foot lets you customize your order by wire choice, stone selection, and length. Jewelry can be worn as necklaces or bracelets and are ideal to layer, collect, and gift. 10% of net profits from your purchase benefits refugee women and their families through the International Rescue Committee Dallas. Co-founded by Women Moving Millions (WMM) member Elizabeth Carlock Phillips. Unleashed – Unleashed is a pending 501(c)(3) non-profit media organization that focuses on helping female craft artisans globally. They connect award-winning producers and directors with artisan collectives to create compelling visual stories and open access to market. Through its content series, Unleashed promotes artisan craftwork and creates business opportunities for those women who do not have the voice or platform on their own. Co-founded by WMM member Kara Ross, pictured to the left. NOMI Network – An organization creating economic opportunities for women at risk and survivors of human trafficking by equipping them with skills to produce goods for the global market place. Nomi Network provides entrepreneurship, leadership and technical skills to women to improve the design and quality of the products they produce. They sell a variety of products including a tote bag that says, “Buy her bag and not her body.” We partnered with NOMI to produce our conference totes for Utah Wonder Women and they were beautiful. Photo is of the three CoFounders Diana Mao, Alissa Ayako Williams and Supei Liu. Same Sky – A trade-not aid- jewelry initiative that employs and empowers HIV-positive women in Africa as artisans. Trained as artisans, SAME SKY women earn 15 to 20 times the average Sub Saharan wage by hand crocheting beautiful glass bead jewelry. Sold online and in stores like Bergdorf Goodman and Neiman Marcus, these beautiful pieces are stylish and support a fantastic cause! I am proud to be one of their Ambassadors. Photo with Founder and WMM member Francine Lefrak. Finally, if you can’t find what you’re looking for in any of the shops listed in our guide, I encourage you to head over to The Little Market to continue your search there. Operating as a nonprofit charitable organization, The Little Market is an online fair trade shop founded by Lauren Conrad and Hannah Skvarla where customers can purchase beautiful products handmade by artisans around the world. The Little Market also provides design insights, helping sales partners to showcase their traditional skills and cultural techniques to a broader audience. The Little Market practices fair trade principles, and every purchase from The Little Market generates meaningful income for the artisans and their families. With such a wide range of products for sale, you’ll be able to find that perfect gift for everyone on your list this year without a doubt. If you know of an organization that should be included in next year’s guide please let me know in the comments below. In the meantime, I’m wishing you and your loved ones a very merry holiday season! Next Post What’s so odd about odd numbers?